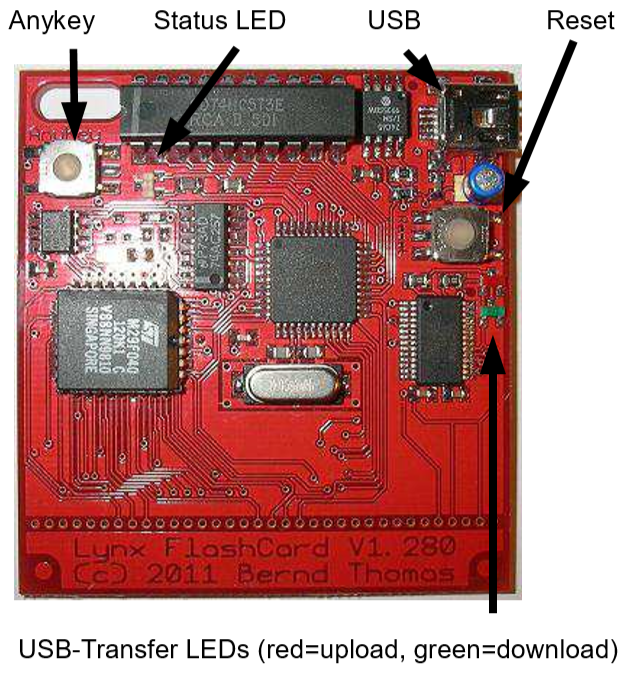 Recently Lynxman released a new version of the firmware for the incredible Atari Lynx Flashcard. I use this card very frequently for testing my homebrew code on an actual Lynx console. In fact, I have 5 different versions of the cartridge with different capabilities and EEPROM FlashROMs sizes. So, the upgrade involved doing the flashing of the firmware multiple times. For future reference, a write-up with some pictures. Terminal software: HTerm, Putty, HyperTerminal or your own favorite tool. The pictures that follow are from Hterm. Find version of your board. See instructions below. Requires the 1.40 version of the firmware. Requires the 6.40 version of the firmware. This is a step by step walkthrough of the process. You can find a similar one in the german and english version of the Flashcard manuals. This is an alternative that has some screenshots. Connect the USB cable to your PC and Flashcard. Install the driver software if necessary. On Windows 10 this might not be necessary. You can check in Device Manager and see if there is a COM port registered. If there is, you’re in luck. 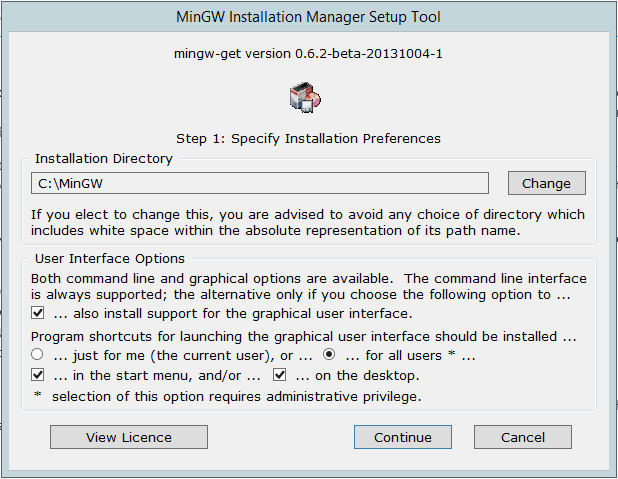 If not, right-click the COM port with the question mark and upgrade the drivers. Start the terminal software and connect a terminal session to the Flashcard. Set the baudrate to the correct value. By default 9600, but probably higher if you used the Flashcard already. 115200 is most likely then. then repeat from step 4 and try a different baudrate (9600, 19200, 38400, 57600 or 115200). The box of your Flashcard will tell the version. Just to make absolutely sure you know what the version of your Flashcard is, check the current firmware version information by sending ‘s’ to the Flashcard. Type the ‘s’ in the textbox and click ASend. You should get data in the Received Data pane above like this picture shows. The actual contents may vary. You need to start the special bootloader for flashing the firmware. 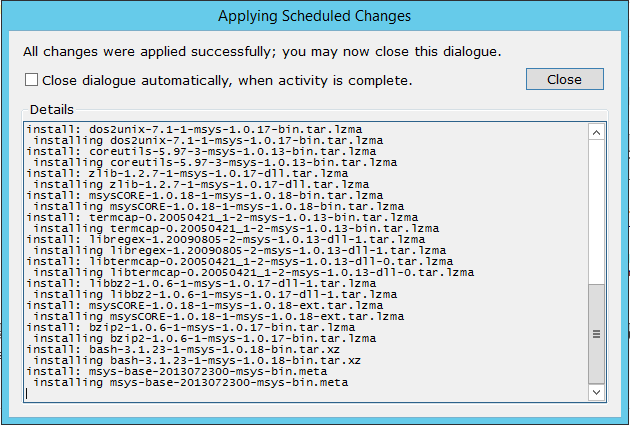 Initiating the boot loader takes a few steps. Read these twice so you know what to do. There are some time critical parts in the sequence of the steps. Set the terminal software baudrate to 2400. Press and hold the AnyKey and do not let go until step 7. Press Reset for 1 second. You will hear a device disconnect and connect sound if you are running Windows. Wait until the LED turns green. This should be within 4 seconds. Be quick with the next step. Disconnect the terminal software and connect again. Simple as clicking Disconnect and Connect quickly. Wait 3 seconds. The LED will glow red. Let go of the AnyKey. The LED should glow yellow and you should see the text ‘send data’ in the terminal window. If not repeat from step 2. You can now send the correct firmware file to your Flashcard. Remember to pick the appropriate version for your Board 1 or board 6. Pick the right file in the browse dialog. or a newer version if you read this after newer versions have been released. Remember that the zip archive must be unpacked. On Windows make sure that you have ‘Unblocked’ the file after downloading it from the Internet. Click Start in the Autosend dialog. The progress bar will grow and the Flashcard will have two red LEDs. 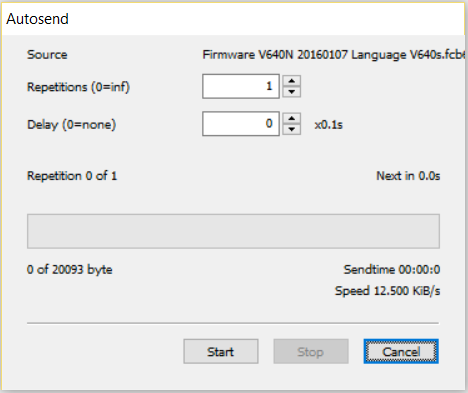 At 2400 baud the uploading of the firmware will take around 1-2 minutes. You should see ‘press reset’ after the firmware has been sent. Press the Reset button (right side of the board). Quickly disconnect the terminal software and connect again. Change the baud rate to 9600. It should say ‘press anykey to prepare for first use’. In case you did not change the baudrate fast enough, it might send some strange characters. The message will be repeated until you actually press the AnyKey. It should be readable after you changed the baudrate to the right value. Press the AnyKey and verify that the menu appears. Notice the ‘erasing memory at the top. Send ‘s’ like before and check that the information corresponds to the new firmware. If all went well you should be able to upload a new ROM file (*.lyx, *.lnx, *.o) into your Flashcard just like you always did. After flashing the firmware the default baudrate of 9600 is selected again. Make sure you select 115200 and set the right ROM type before uploading. Let me know if this works for you or when it doesn’t. In part 16 we investigated the way cartridges work at a reasonably low level and how the CC65 libraries help out by providing cartridge read functions from a start position and onwards. In this part we will take this one step further and introduce the file system that Epyx introduced and is still used in most cartridges. Also, we will see how such files are created and put into the ROM image. That will bring us right back to segments and memory from part 15. So far we haven’t really looked at how ROM images are organized. There are quite a few types of images available. Most of these images are related to the development kit that was used to create them. Two of these image types are more alike than you might expect. 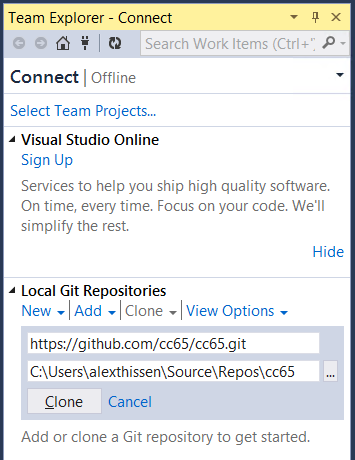 Even coming from different development kits they use the same directory and files structures. The Epyx .rom, the .lyx images (and therefore also the CC65 .lnx images) all have a directory that lists one or more files for the game to load from cart into RAM memory. The Epyx development kit introduced this as a (partially optional) means of partitioning content on a cartridge. You could choose not to use it, but you must have at least one file entry to make a bootable game on real Lynx hardware with the original encrypted headers. If you create your own boot loader in the encrypted header of a cartridge you could dispose file entries and the directory all together. As it turned out, the mechanism of having a directory structure proved to be really useful. Useful and relatively easy, as most segmented games have used it ever since. The functions to load files from the cartridge have been put to the test extensively and work like a charm. Each of these areas consist of one or more items. Here’s a graphical view of a cartridge that you could find in an arbitrary, generic retail cartridge for the Lynx. The three areas are marked in green, orange and grey. The header with its encrypted two stage loader is a requirement for games that need to run on actual hardware. There are variations to this theme (it does not have to be a two-stage loader per se), but the original retail releases all had them. The directory holds the file entries, which in essence are offset pointers to the “files” on the cartridge. These files follow the directory and consist of any number of up to 256 files. Typical for the Epyx two stage loader is that the first file holds (must hold) the title screen that is shown during the booting of the Lynx and game. The second one is the main executable. After that there can be any number of files holding code, data, music, graphics, whatever. The file entries contain the information to find the start of the particular bytes on the cartridges, expressed in terms of cartridge page and offset in the page. Three bytes are used for that: one byte for the page number, as there are at most 256 pages in a cartridge, then two bytes for the offset, because the pagesize can be as much as 2048 (sometimes 4096) bytes. The other things that a file entry has are the length of the file in number of bytes and the load address in memory. That’s another two bytes for the length (no use to have files longer than $10000 because that is the maximum RAM memory size, assuming you do not intend to stream from the cartridge) and two for the load address in the $FFFF address space. That’s 7 bytes, plus an 8th byte that is used as a reserved flag with value 0x00. 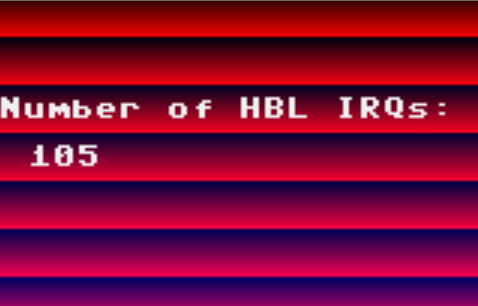 It is not actually used in the Epyx style of file entries, although the BLL style file entries use it to mark it as an executable (0x88) or normal data file (0x00). You can see the offset, length and load address in LSB, MSB format. This particular file entry of APB is used to load the title screen from the cartridge at the first (zero) cartridge page with a 666 (0x29A) bytes offset. The title screen has a length of 3291 (0xCDB) bytes and is loaded at 0x8000 in RAM memory. Refer back to the previous picture and you should see that it indeed shows that the second file is located in page 3, 0x375. It is 0x1B4 bytes long and loaded at 0x0400 (which is typical as it is right behind the loader code from 0x200 to 0x3FF). 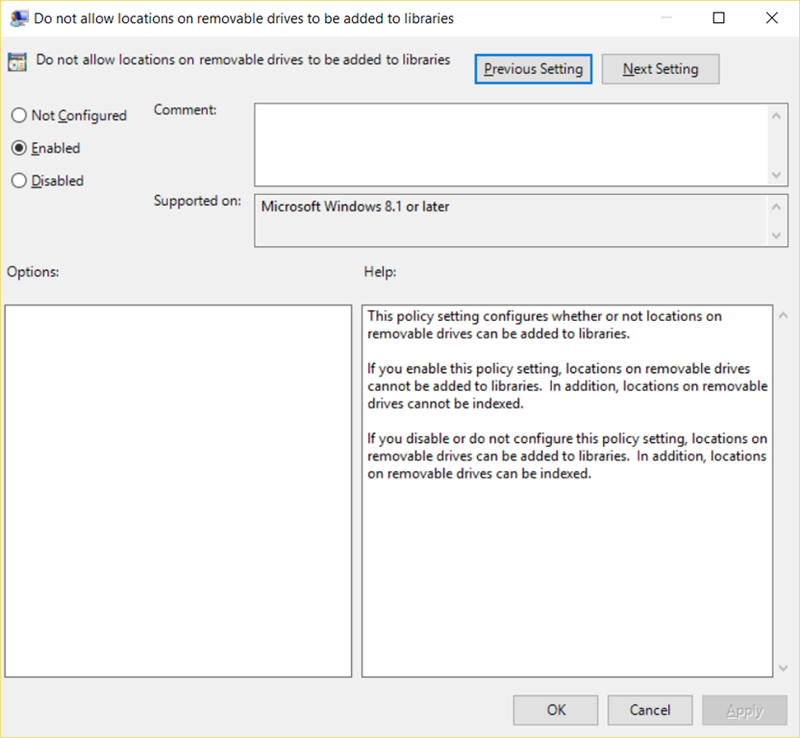 You could repeat the process to calculate the next file location from there and keep continuing until you reach the end of the directory and the start location of the first file. Note that it doesn’t always work out like this with files being contiguously located on the cartridge. You might decide that a file needs to start at a page boundary, meaning an offset of zero. This is much more efficient for loading, as you do not have to do dummy reads to advance the counter. The cartridge will end up with some unused space (call it fragmentation) caused by gaps from the end of a file to the start of the next page. It’s a trade-off between compactness/space and efficiency of loading files. All right, so far we know that each file entry is 8 bytes in size. You can find a particular file entry by skipping the 8-byte sets. For example, to read file number 3 (zero-based numbering) you would skip 3*8=24 bytes from the start of the directory, bypassing file number 0, 1 and 2, and reading the 8 byte tuple for the 4th entry. From the bytes the cartridge’s shift register for the page number is set, the dummy reads to advance the ripple counter are done and you start copying the bytes from every read to RCART0 to the destination RAM address until you have copied enough bytes for the length specified. In CC65 all logic to do the preparations (shift register and ripple counter) have been taken and captured in the assembler code from lynx-cart.s. It holds the functions to skip bytes, read a single and a number of bytes, plus page (block) selection. To load individual files as specified inside a directory by a file entry you need the lynx_load function from load.s. This functions is available by using the include file lynx.h. I couldn’t imagine a scenario where you haven’t already included the file, so you should be good to go. The lynx_load functions is really simple to use: pass the file number and the file’s bytes will be read into RAM memory as specified in the file entry. Typically you will use define statements to give the symbolic, readable names to the file numbers. More on that later. Before we can start creating a directory structure we need to know how CL65 as a linker will create an image and how our “files” are laid out in that big binary blob. You see, CL65 does not know nor care about files. It views your code and resources in terms of segments that are loaded into memory. You might want to refresh your knowledge of that by rereading the tutorial part on “Memory and Segments” before continuing. Of the 64KB memory that the Lynx has a smaller number is available after the video buffers, C stack have been assigned. If you have only a little code and data that will all fit in the remaining memory, you will probably not bother with files. But just imagine the challenges that arise when you have more code and data than fit into memory at one point in time. You will need to plan what will be in memory when. From that you will create a memory plan that shows the various memory areas that exist. The special areas, such as zeropage, stacks and the videobuffers, are required for any Lynx game to function. This is regardless of the development kit you are using, except maybe for the C-stack. From here on these are not shown anymore, even though they might be located else in the memory space than in the initial pictures. Their location is fixed throughout the lifetime and state of the game and usually at the bottom and top of the 64K memory range, like shown in the picture. The example game we will use is a game that starts with an intro, consisting of a title screen and some music. Pressing A will start the game, where you will battle some nasty aliens, listening to different, exciting music. When you loose all your lives in the game, you will see a game over screen that plays some sad music. After this you will return to the intro screen and this loop starts over. The core of your program is always be in memory and in charge of loading and running the other parts of the program. 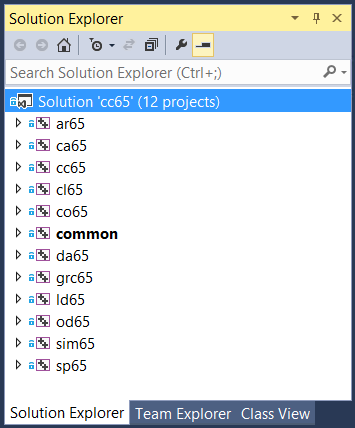 There is also a resident part related to the C-runtime, because we are using C and CC65. Perhaps a good way to design your memory areas is to start from the building blocks of your game. You pick your building blocks (intro, main game, outro, music, et cetera) and determine their required memory size. Next you need to place these blocks in the available memory space. If the sizes required by the blocks are small enough you can create a single memory area that accommodates all blocks at the same time. You would have the intro, outro, game and all three music pieces in memory simultaneously. Lucky you. In this case, you create one big memory area that spans from $0200 to $BE38 and place all code and data in there. 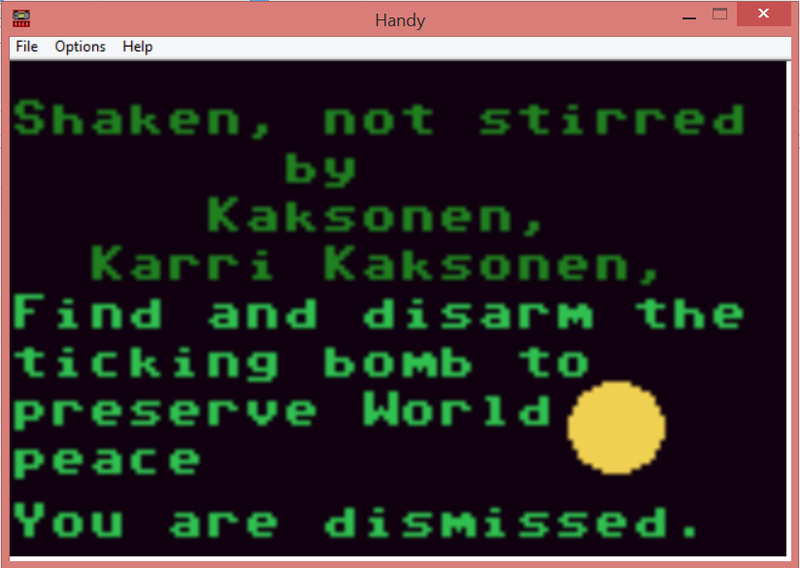 You could read it as one big blob from cartridge and execute it. If you have come this far in the tutorial series and have already created a game without having to use the lynx_load function, then you have done this already. Here is the MEMORY definition from the lynxcart.cfg file that shows a single RAM section. The name for the area that holds the C-runtime and required startup code and data must be named RAM. We saw this before when we talked about memory and segments. However, if you find that it does not fit, you will have to time-share the memory space in a smart way. That means creating areas where the “occupants” are not in their assigned “appartment” at the same time. It is like a puzzle: what should be together in memory when? The resident part will always be in memory and never be unloaded or replaced. The functional parts however will occasionally be in memory and not necessarily at the same time. That’s a good thing, because when the total size of these part exceeds the available memory it wouldn’t be possible anyway. 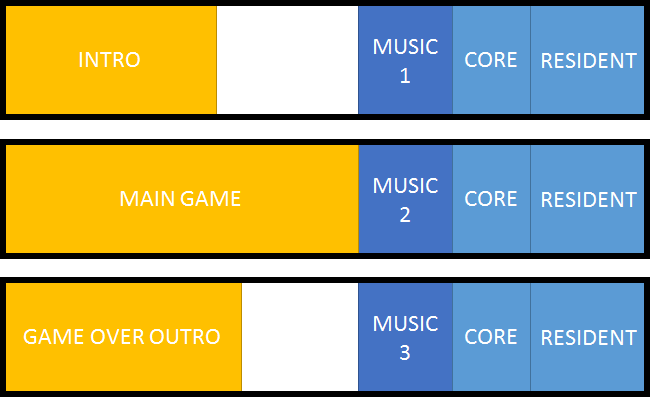 The top layout shows the intro in memory (yellow), next to the intro music and the core part plus some additional resident stuff (all blue) that the C runtime needs. During gameplay the intro is replaced with the game code and resources. There will be different music, but the area in memory is the same. It’s just that other music will be loaded. Essentially the same as the intro, except with other code and resources, and different music. For now the important parts are those that vary, and they are represented as the yellow and dark blue areas. The resident block is not free to use to your liking, but reserved. Notice how the amount of code and data loaded into the area before music differs. The intro requires less space, but the main part of the game uses the full amount of memory available in that area. The core is responsible for loading the intro, game and outro. It should also load the correct music data. Because the music will always be playing regardless of the state the game is in, the code to play the music must always be present. That means that either the core or music area should hold the code to play the music. Placing it in the core is more efficient (placing it in each music area means it has to be loaded each time and must be present on the cartridge three times as well). The yellow areas are self-supporting parts of the game that have all code and data inside their respective memory blocks. When designing your memory layout you need to be aware that there is a difference in the area of memory and the code and data that is loaded there at a particular point in time. Looking at our scenario you might be tempted to think that there is 1 memory area for the yellow blocks, from $0200 to around $7000, which we will name YELLOW for the sake of argument. But, in actuality there are three memory areas and YELLOW is not relevant. The memory areas are INTRO, MAINGAME and OUTRO and they just happen to be positioned on top of each other. You could create a flexible layout that gives the music as much space as is available after the yellow area. That’s a valid option in which case INTRO would be $0200-$5000, MAINGAME from $0200-$7000 and OUTRO from $0200-$6000. Instead our approach chose to keep the memory sizes fixed from $0200-$7000 across the three game states, because the layout does not require the empty space left by INTRO and OUTRO. The same approach is taken for MUSIC. It is actually three areas (MUSIC1, MUSIC2 and MUSIC3) when the music loaded at each time is different. They can be the same size even though the exact size of music pieces 1, 2 and 3 are unlikely to be exactly the same. We will compute the yellow blocks from the start of available memory $0200 and place the music right after it. The required RAM area needs to be located at the end of available memory right before the C-stack. Therefore, it is calculated from $BE38 backwards. We will need some symbols to make things readble, flexible and maintainable. The bolded items are of interest for now. They indicate the sizes of our various blocks. After laying out the memory requirements and areas we essentially have a few buckets where we need to put our code and data in. At this point we return to where we left of talking about memory and segments. By assigning code and data to the various segments, we can fill the buckets with all types of segments CODE, DATA and RODATA. BSS segments are never placed on in binary files, because it is all uninitialized memory anyway and nothing more than a memory range. It is the usual definition of the required segments that go into the standard memory areas. For the game we’ve been discussing some additional segments are required. It is actually not that special. All code and data with the INTRO_ prefixed segments are assigned to go into the INTRO memory area. The same is true for the MAIN_ and OUTRO_ segments. You might notice how the MUSIC1, 2 and 3 segments only have a RODATA segment defined, as the music itself is just read-only data, not changing data, nor code. You can safely assume that the linker will place the segments in a memory area in a certain order. How it is laid out is not really relevant. As long as you make sure you have loaded the code and data into the area before you start using it by calling the code or referencing the data. What is more important is that the linker will create the binary file that holds all code and data in the order that the memory areas have been defined in the MEMORY section. The linker will emit the binary image with “files” for each of the areas that have a file=%O in their definition. This attribute will make the linker emit the contents of that memory area in the final file. You can see how it is referring to %O for each area, effectively appending the contents to the same, single output file. This file will be called whatever you have set as your target in the make file. Long story short: the target is the file that is called %O in the memory area. In it all memory areas are written in the order in which they are declared. The order of the segments per area is not relevant. The final thing that keeps us from having a fully functional file system is a directory. The purpose of the directory is to list the “files” and their respective positions within the binary image. In the end, the virtual file system of an Atari Lynx cartridge is nothing more than make believe. When we are able to compute the file entries like we saw at the beginning of this part, we are good to go. The directory.asm file builds no code, just data representing the file entries. Here is the skeleton of the file, where details have been omitted for now. The directory is created in a segment called DIRECTORY. It will hold the 8 byte entries that indicate where the files are located in the binary image on the cartridge. You can see how start and end address symbols (__DIRECTORY_START__ and __DIRECTORY_END__) are declared these are used to compute the length of the directory itself. The first entry is our RAM area where the C-runtime and other resident code and data are located. First, the offset of the RAM area off0 is computed, by taking the start location of the directory and adding the length of the directory to it. The page number is computed from the blocks already taken up. Next the length of the current area is calculated by adding the startup and initialization segment sizes, plus the code, data and read-only data segments. All of these were defined to go into the RAM area. Finally the file entry is added as raw bytes with the .byte and .word statements. Take a look at the picture above to see that it creates the right data. Normally you do not need to change this first entry at all. It is special in that it has multiple parts and requires the total size to be computed from them. The next file entries are more of the same. The help in creating them easily a macro is included in the default directory.asm file. You use the macro entry by feeding it the offset (which has the page number and offset) and length of the previous (old) area, plus the size and load address of the current (new) area. The variables off0, len0 are the offset and length from the RAM area. off1, block1 and len1 are variables that are passed without meaning values. They will get a value after the macro has executed. Two of these values (new_off and new_len) will be used to feed into another macro call to create the next entry. You will also add the new size and address. This repeats over and over again until all entries have been created. One thing we didn’t cover so far is where all these double underscore pre- and postfixed values come from. They are imported at the top of the file and come from values that the linker has emitted. Remember how the linker would create _SIZE__ and _LOAD__ postfixed values for each MEMORY and SEGMENTS declared area and segment that has the define=yes attribute set. 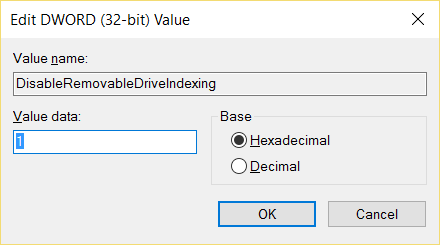 From these values you can calculate the file entries, by simply adding the sizes to the old offsets. It’s like creating a long line of the memory areas, one after the other. Typically you will use the _LOAD__ of the first segment in an area. The order of the segments is not really relevant, except that you need to take the first one listed per area. Like the areas themselves, the segments are laid out sequentially in a particular area. This implies that the first segment is located at the beginning. The various sizes you add together come from all the segments that are located in the area. There could be more than just one of each CODE, DATA and RODATA. It all depends on how you assigned segments to areas. Let’s do a quick recap of what is needed to create a files and corresponding directory. Create your memory areas based on the sizes they will need. Make a layout of the areas in memory and moments in time. Create a directory entry that lists all memory areas, starting with the RAM area. In each part of your code, be mindful of the expectations for segments that need to be loaded. Call lynx_load before accessing functions, variables or resources in a segment. Here is a typical piece of code that shows how to use the lynx_load and file numbers. In the code fragment, which could be inside your void main() static entry point routine, the show_intro function is located in the INTRO area. It needs to be loaded before it can be called. Hence the call to lynx_load, passing in the FILE_INTRO symbol. Having the names and number of files decoupled will be very useful when you need to reorder files in the binary image. You can change the file numbers in one place and will not have to hunt your code to check where you used the particular file number that has changed. At this point it is worth mentioning that the first file (RAM) is only there if you use the mini-bootloader. That loader does not require a startup sprite. For games that use the Epyx bootloader, you would have seen a first file pointing to sprite data, and the second file to the resident RAM file. You might be lucky and get it all to work the first time. If you did not manage to do so, or want some more internal look at what has been done and generated, you need some more information. That’s where the map file comes in handy. 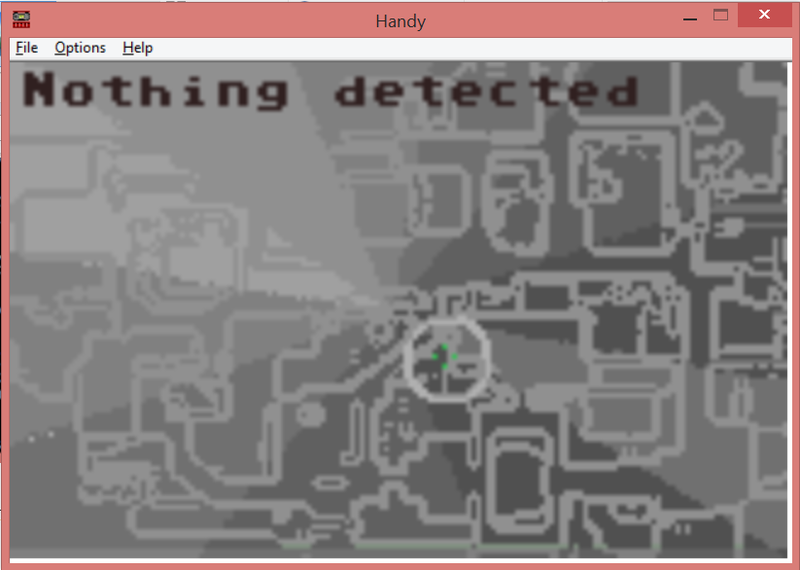 The map file shows a lot of things for your program/game, including the segment locations and what is located where. 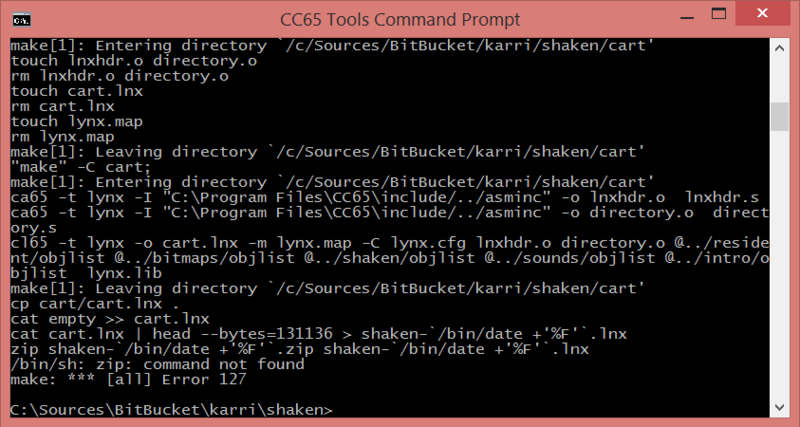 To generate a map file an additional argument is needed in the call to the CL65.exe linker. The segment list above shows the start and end addresses, plus the sizes of the segments that are created. It is not the complete list, but you can notice how the OUTRO_BSS is missing. Apparently nothing was created in the BSS segment for the OUTRO and there was no need to emit it. The bolded items will look familiar by now. Inspecting these values help find any overflow errors that the linker might report, or troubleshoot directory issues. A detailed look at how to track these errors is for another time. We’ve looked at how to design your memory and create segments, files and the entries for your directory. With this you can start building beyond the 64KB limit that you otherwise have. Next time we will look at encryption of headers, or maybe input. Who knows. Till next time. 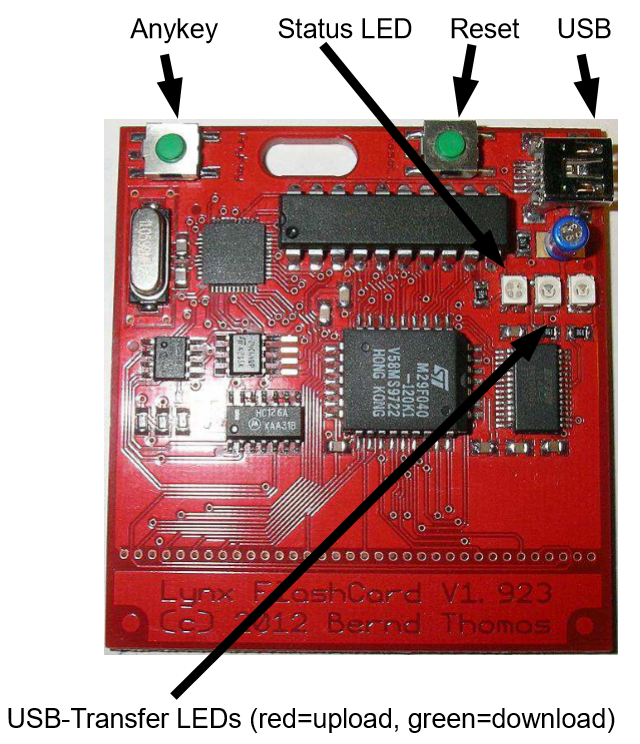 Let’s skip a lot of things you need to do to create your first Lynx binary, be it a game or another type of program and pick up at the point where you want to run your program on real hardware. In the early days of Lynx development there was no emulator, so you could only see and test your code running on an actual device. Nowadays it is trivial to create an encrypted ROM, put it on a FlashCard and run it on a normal Lynx. 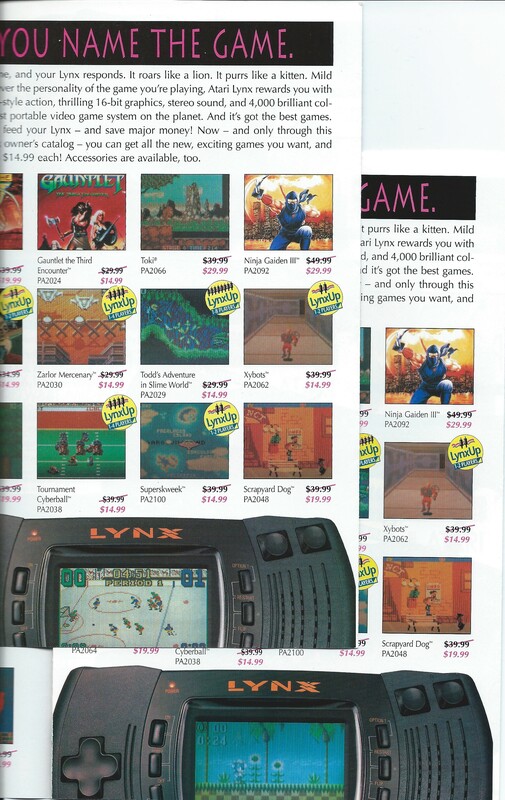 In 1989 Lynx developers only had either Pinky/Mandy or Howard/Howdy. The focus is on Pinky and Mandy although most holds true for Howard and Howdy. Pinky can function in one of two ways. 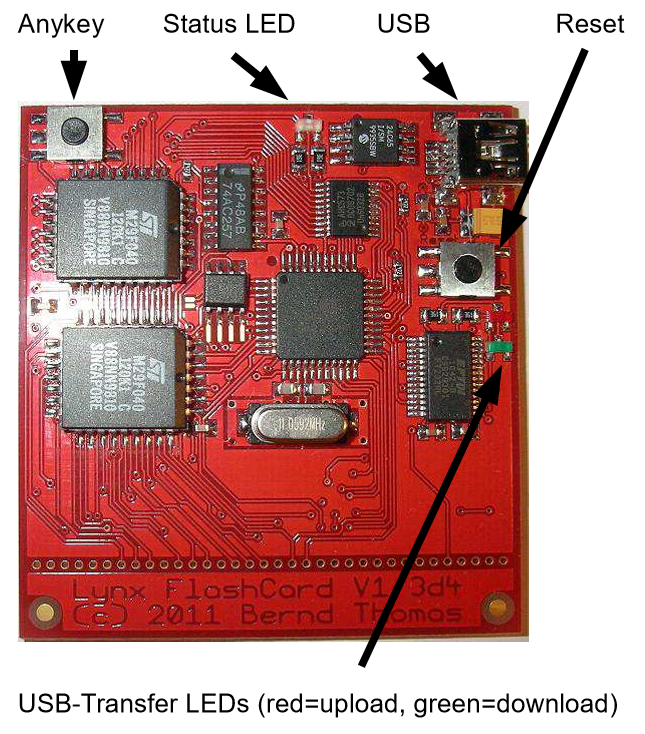 It can be a FlashCard of sorts, where you can upload your code in the device and have it act as a cartridge to Mandy. 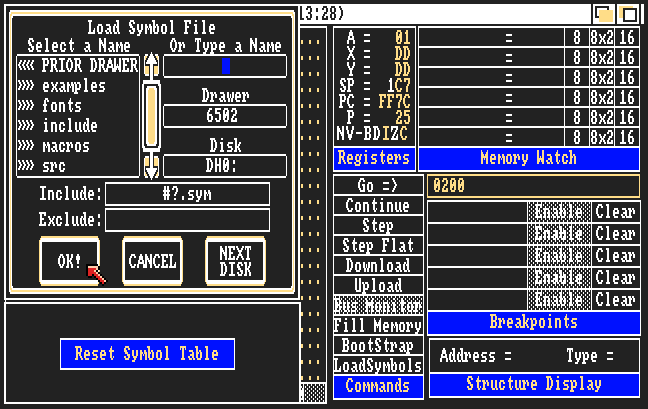 Additionally, it can be a passthrough communication device that facilitates in a live (remote) debugging session between the Amiga computer and the Mandy console. 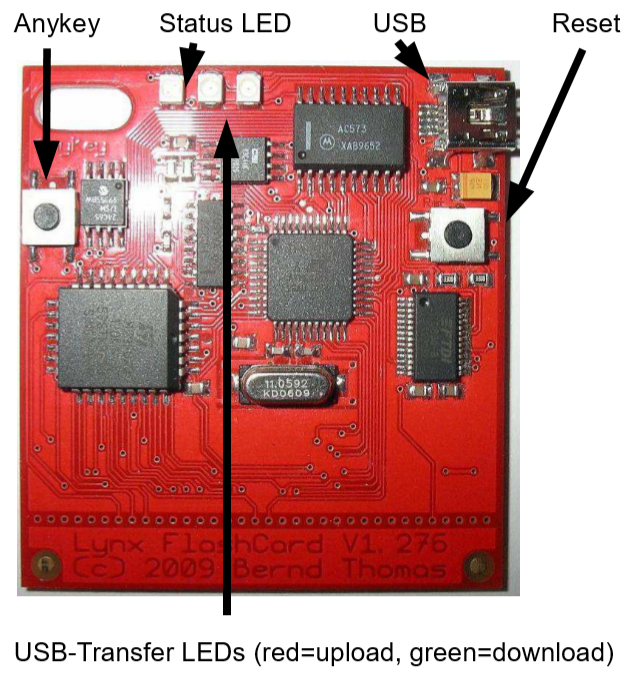 A set of jumper switches allowed you to change the mode of Pinky and configure its memory size and use of the EPROM with the Pinky bootloader. For a regular debug session with Pinky and Mandy you would connect Pinky to the Amiga with parallel port and Mandy using the propriatery flatbed cable. Next, you would start the Amiga and run the ManDebug debugger program. Here’s a small bit of what is happening under the covers when you boot a Amiga machine that has been modified by the Epyx SDK. 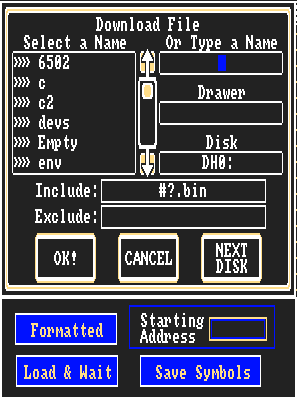 Essentially it assigns drive letters (symbolic names) to the two important SDK folders 6502 and HANDY. 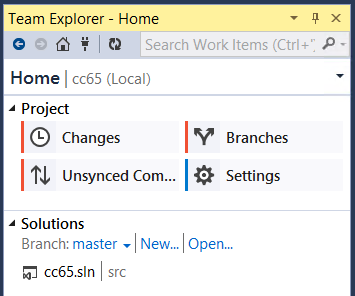 It also adds the HANDY drive to the search path, so you can run the SDK tooling from everywhere. Finally, the ManDebug program is launched separately from the Shell, keeping it free to do other things. The pictures below show what ManDebug looks like running on my Commodore Amiga 2000 computer, plus what Mandy shows on the screen after booting (a line indicative of the loader program placed in middle of video memory). The Mandy console uses a normal Atari Lynx power supply with +9V DC. The power adapter powers both the Mandy and Pinky device and it needs the full 9 Volts to do so. Mandy switches on like a normal Lynx and immediately turns on Pinky as well. The boot process depends on the jumper settings. Assume that it set for the debugging scenario, meaning that it will use the Pinky EPROM as the first content on the cartridge. 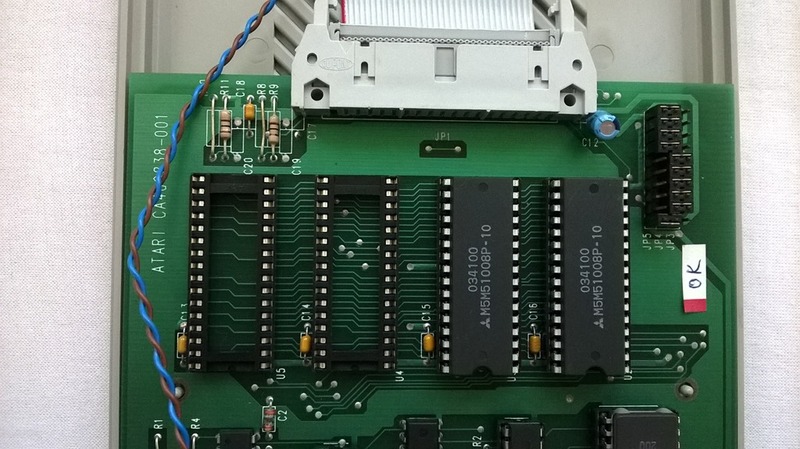 It is encrypted in the EPROM and follows the normal decryption process once loaded by Mandy after booting and loading the “cartridge”. You can find the decrypted contents at $0200 like you would for regular (commercial) cartridges. 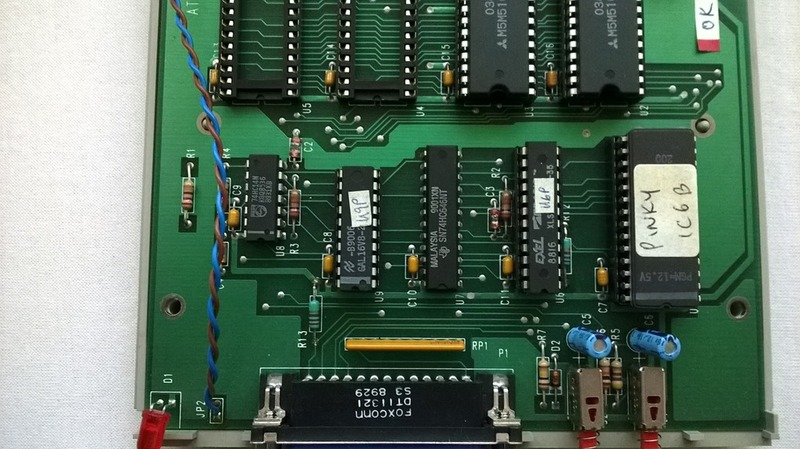 The Pinky EPROM will load a second stage loader that expects block of bytes to be uploaded from the Amiga via Pinky to Mandy. This part will copy the second stage loader from $021B (directly after the first part) to $3000. This address also serves as the NMI vector, i.e. the address that will be called when an NMI occurs. Finally, the first stage will stay in an endless loop and wait until a NMI interrupt occurs. Harry Dodgson explained this to be a “hardware lockout”. Indeed, the contents of the Pinky loader is general purpose and circumvents the need to have an encrypted header for the ROM itself and bypasses any checksumming on the contents of what is loaded. 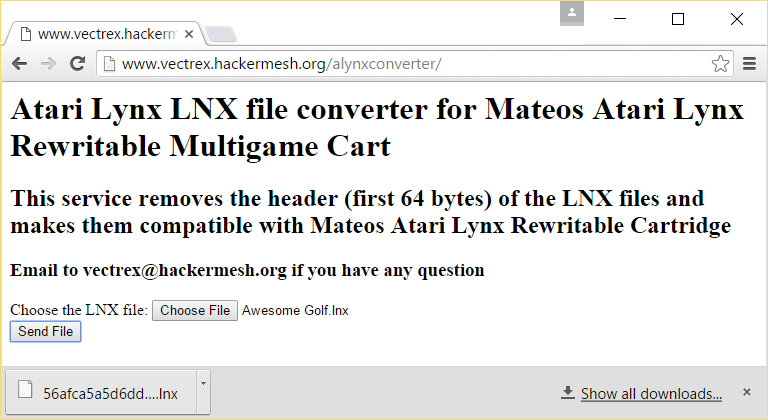 Essentially, it is a perfect troyan horse to get your homebrew code into a Lynx. The dependency on a NMI hardware signal makes it impossible to use this without a Lynx console that has been modified to allow an NMI falling edge to occur on the respective pin on Mikey. So, it is a lockout of the ROM using hardware. 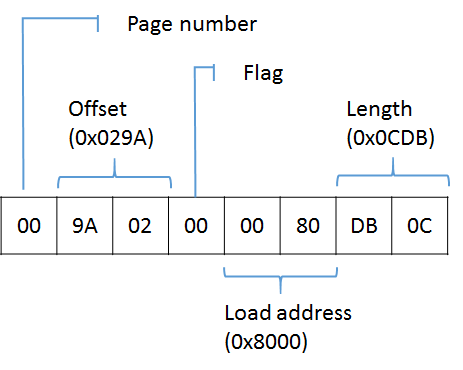 The first four bytes indicate the load address and length. The loader reads the data and copies it to Mandy RAM memory at the load address and finally execute the loaded code. 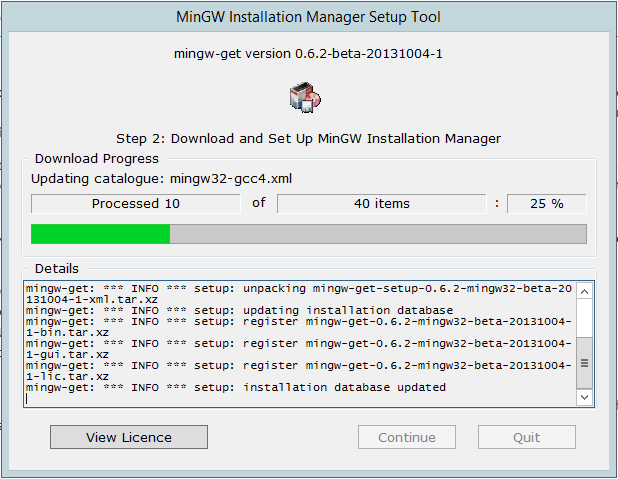 For debugging, it is necessary to first upload a file called monitor.bin. You click the Bootstrap button and a dialog opens that lets you specify the file. The monitor.bin file has code that will communicate with the Amiga by using Pinky as a “dynamic” cartridge. It will use different cartridge pages to indicate which parallel port line it want to read from or write to. It will use the data lines of the port for data transfer and the input and output control lines for negotiating the conversation. Mandy will run the monitor program after having loaded it at $F900-$FF00. The monitor will intialize itself by setting the IRQ and NMI vectors to point to its own two handler routines. It performs a handshake ritual to initiate the communication with Pinky whereby the connection with the Amiga is established. 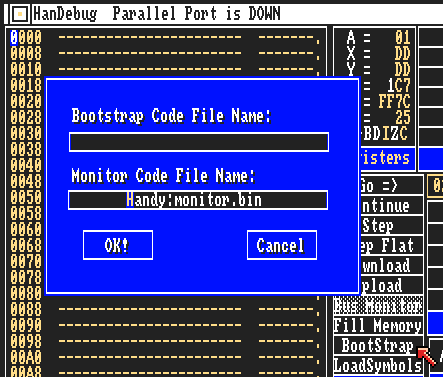 The title of ManDebug will change from “Parallel Port is DOWN” to “Parallel Port is ACTIVE”. 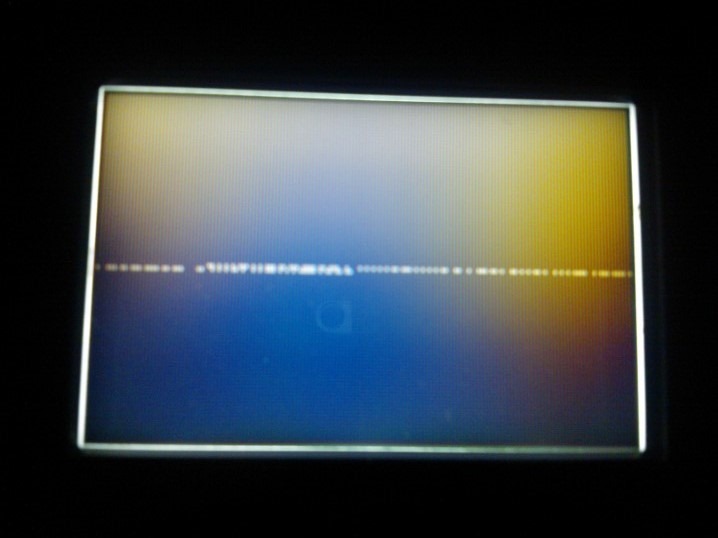 Then the monitor sits idle waiting for the first incoming command from ManDebug. All electronics aside the communication between the Amiga and Mandy consists of sending commands from the Amiga to Mandy and receiving answers in the opposite direction. This will create a NMI signal that causes the NMI handler in the monitor to execute, because the NMI vector is set to point there. At that stage the monitor takes over control and performs its handshake ritual. Whenever a BRK is executed by the 65SC02 processor, it will perform its normal IRQ routine and jump into the IRQ handler. But, for a BRK instruction the B flag is set in the processor status register before it is pushed onto the stack. 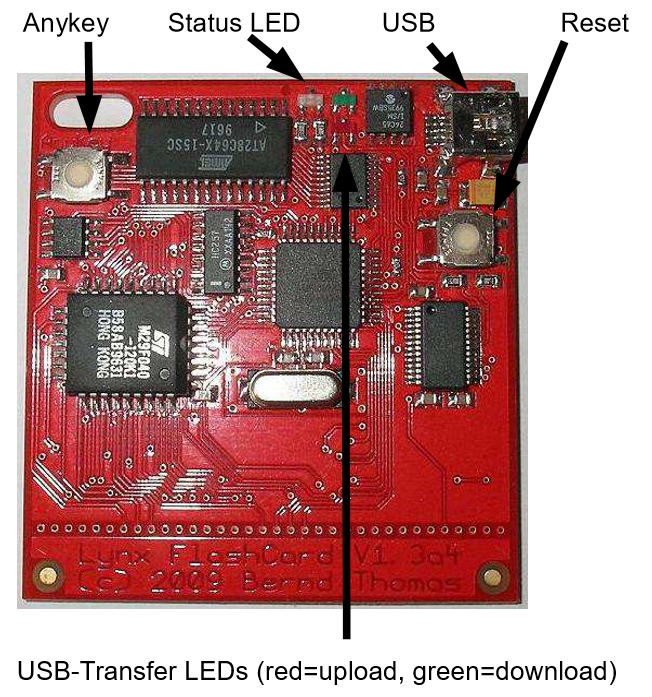 It allows the handler to inspect whether a normal IRQ from the timers came in or a software IRQ from a BRK instruction. The IRQ handler is also inside the monitor and will check the presence of the B flag (for the BRK). If present, the NMI handler will be called. Otherwise, the normal IRQ jump table will be used to jump into the respective IRQ handlers that were (potentially) registered for the 8 timer IRQs of Mikey. 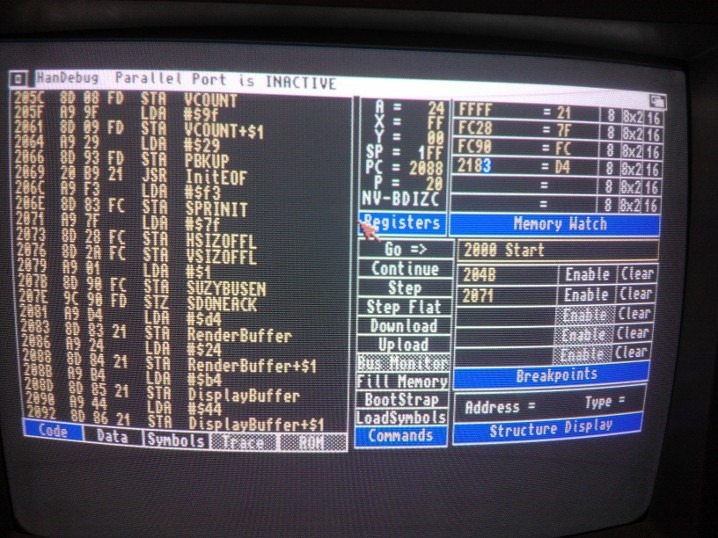 This includes the registers A, X, Y, the processor status, stack pointer and current program counter address and the current RAM memory (entire range from $0000 to $FFFF). The variables you want to inspect are single byte or double byte values located in memory. 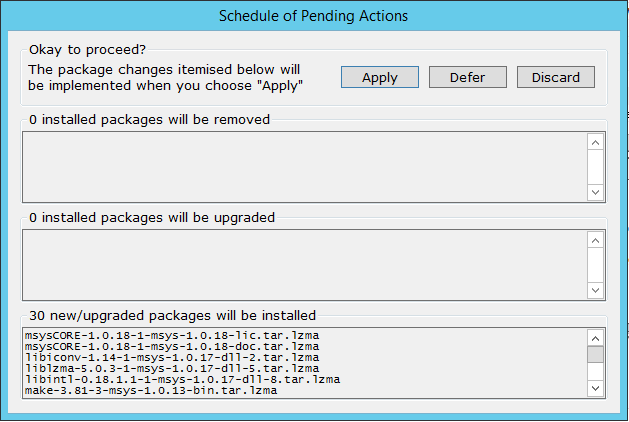 The current value is shown for the variable and update whenever it changes, provided the monitor is in control again. A breakpoint will cause the monitor to be in control again, so you can inspect the state of Mandy, alter it if desired and resume execution. It is possible to step into JSR routines or skip over them. When there is a area of memory that has a specific layout (such as a Sprite Control Block (SCB), you can declare the structure of the memory and view the memory in a window that is specifically designed to show the structure. This will restore the pre-interrupt state and resume execution of the program. It means that the monitor releases control and gives control back to the program again (at the risk of not regaining it by a breakpoint). A single constant byte will be used to fill a part of memory. It can be used to wipe a piece of memory using all $FF for example. The specified range of current RAM memory values in Mandy is sent from Mandy to the Amiga and is stored in a file with a name and format you have chosen. This will send the contents of a file from the Amiga to Mandy. The Download and Upload commands are other loops, with subcommands. We’ll discuss those shortly. 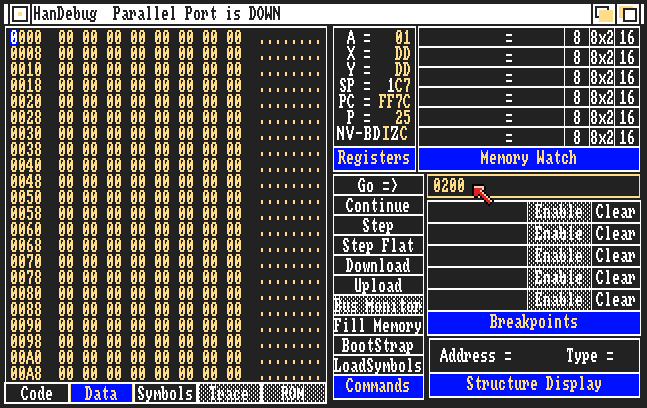 “Continue” will restore the pre-NMI or IRQ values for the stack, A, X and Y plus the processor status register and jump back to the previous address before the interrupt. “Go” resets the IRQ jump table and then do a “Continue”. I have not figured out what the “Slave request” is supposed to do, but I assume it puts Mandy in control to initiate requests to ManDebug. The last two commands are not available in ManDebug (unfortunately), because of the missing hardware. Only commands 0, 1, 2, and 10 are used for Upload. Download uses all of them. Using a combination of sending such commands, the functionality of ManDebug is implemented. For example, to download a file into Mandy, the debugger will send a DOWNLOAD_REQUEST first, then an ORIGIN command byte to indicate the load address, followed by LARGE_DATA (accompanied by the length and the actual data). It returns to the main loop again by END_OF_FILE. With a logic analyzer you can actually see the bits going across the parallel port. The picture above shows the data lines for a simple command sent from the Amiga to Mandy (through Pinky). Analysis of the various functionality showed that breakpoints and the stepping are actually made possible by replacing the instruction at a specific address with a BRK command. A pretty nifty trick that makes use of the IRQ handler to call the NMI. For breakpoints the original instruction is remembered and replaced by BRK. When it the original instruction is restored. Stepping involves replacing the next instruction that will execute with a BRK. This can be determined easily if you know how the instructions behave. This is deterministic, even for branch instructions if you know the status flags. Fortunately, you can transfer the current state of the processor status as part of the whole set of 65SC02 registers mentioned earlier. When control returns after a step, the original instruction is restored and the next instruction is replaced. It can happen that when a step is performed the next instruction is never reached. In that case ManDebug will report that control did not return. 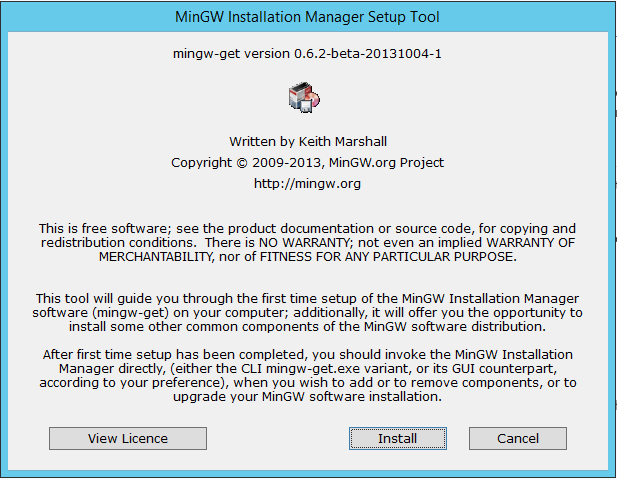 Your only option to regain control is by hitting a user-specified breakpoint or pressing the NMI button on Pinky. 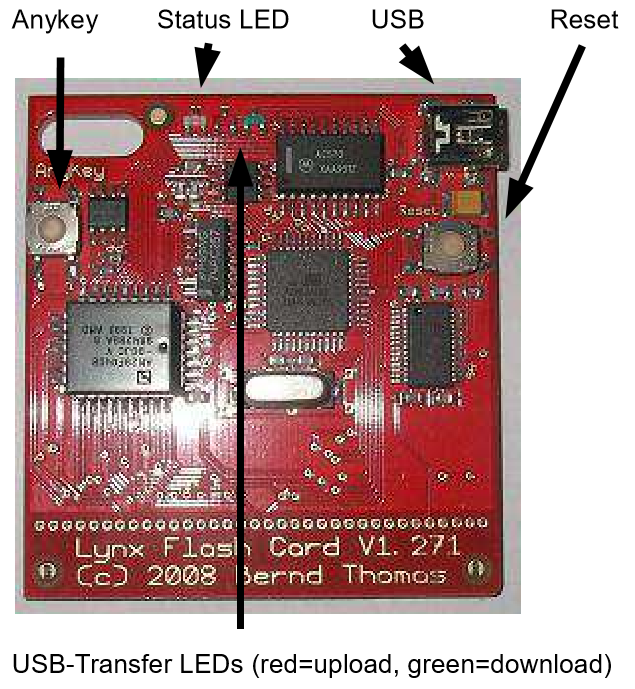 Mandy is a slightly modified, fully functional Lynx I that has the Reset and NMI pins connected and has a special “cartridge”. The cartridge is essentially a connector to Pinky. 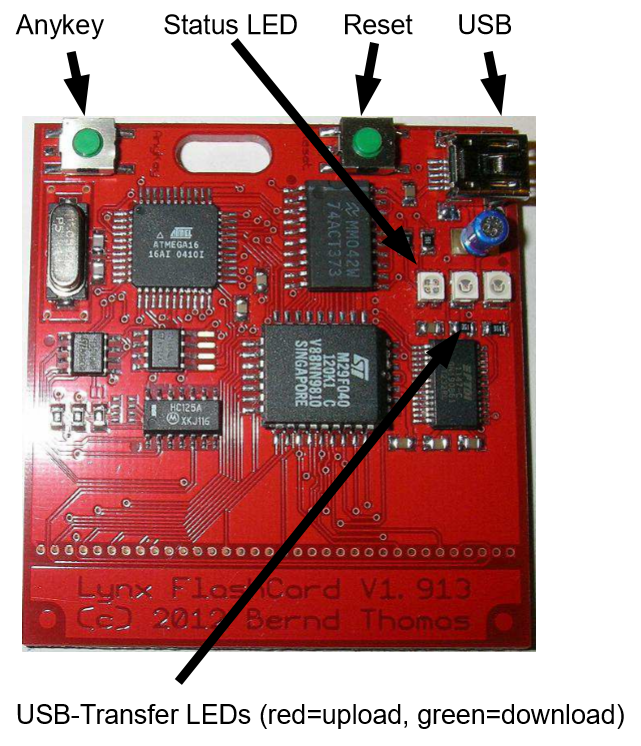 Pinky is a custom electronics board that sits between the Commodore Amiga and Mandy to facilitate the communication and optionally hold ROM images of your Lynx programs. It has two buttons to trigger the reset and NMI signal to Mandy. Outside of Pinky with the blue parallel cable and two buttons (Reset and NMI). You can see some additional pictures here at the Handheld Museum. This hardware set was more expensive than Pinky and Mandy, but offered some extra functionality. The set has two pieces of hardware called Howard and Howdy. Where Mandy is a full Lynx, Howdy has no processor and memory of its own. 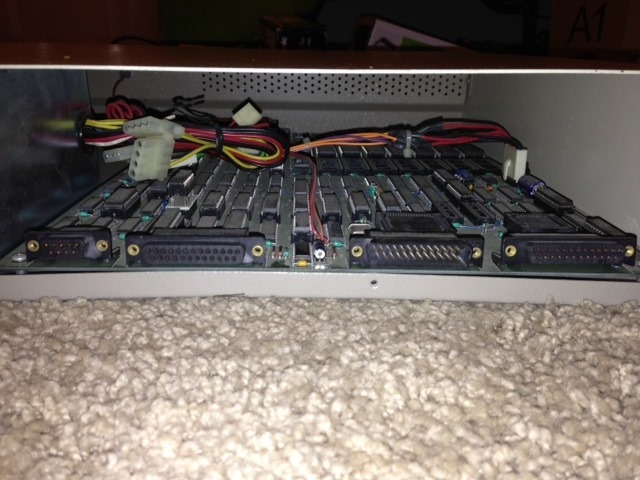 Instead, the guts of the Lynx exists in Howard, a PC case with a huge motherboard. It holds the 65SC02 processor and lots of RAM and additional logic to offer functionality for bus monitoring and tracing of your code. Howard is connected to Howdy for display, sound and input. In turn, the Amiga is connected to Howard. 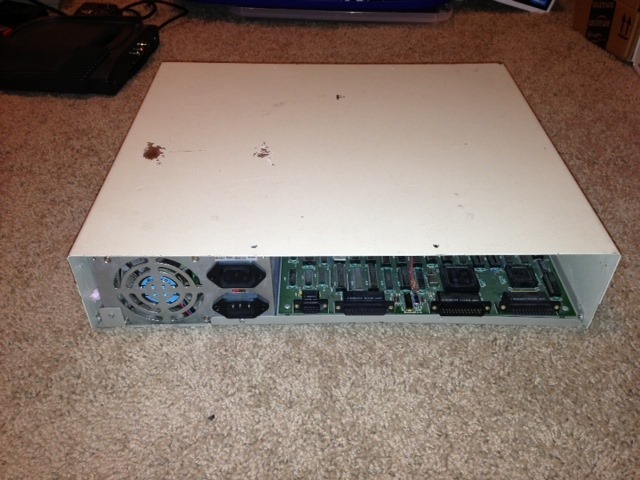 The last two pictures (from this thread at the AtariAge forums) show the Howdy console connected to Howard. 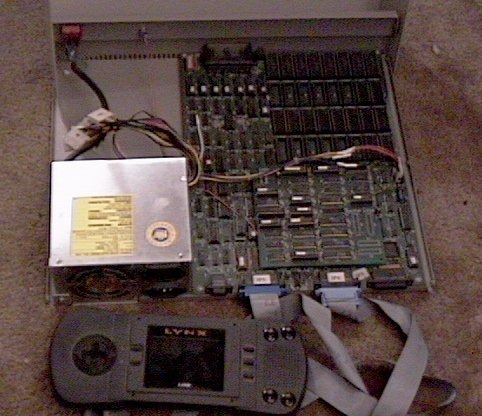 The Epyx kit did not include the Commodore Amiga 2000 that was needed. You could have any Amiga machine, but the 2000 model was recommended because of its harddisk and memory. 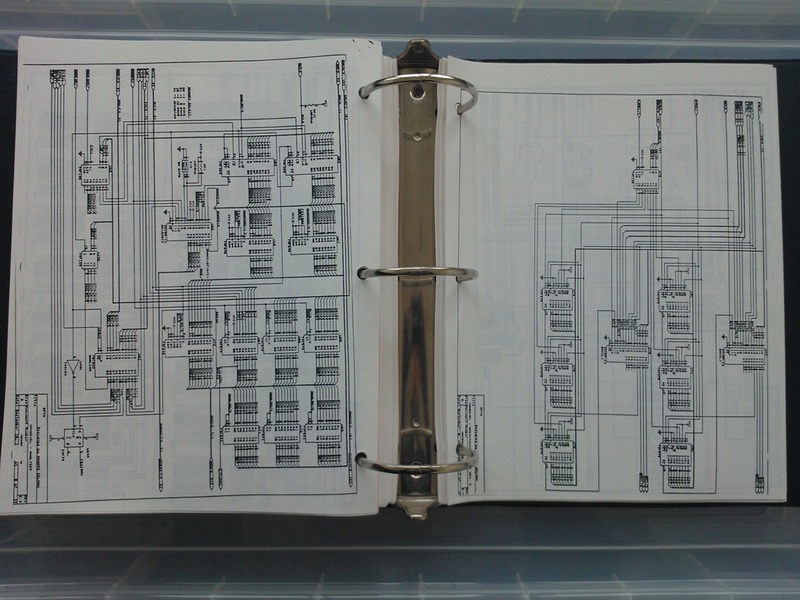 A binder full with hundreds of pages detailing the internals of the Handy hardware, the use of the Amiga software and Epyx SDK for developing Lynx programs. 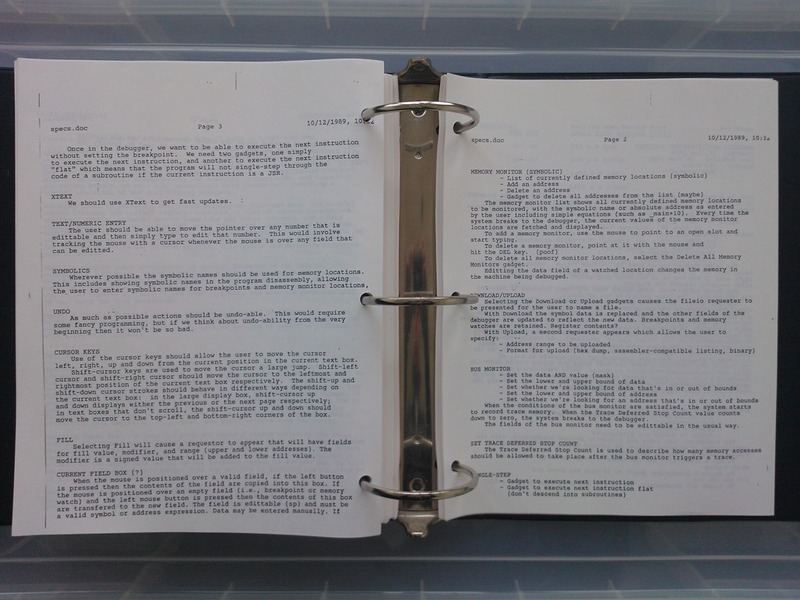 When updates to the SDK were made, addendums where issued that you could place in the binder. The software accompanying the the development kit is provided on a set of 8 disks that contain the Amiga software, source code and samples you need to develop Lynx programs. 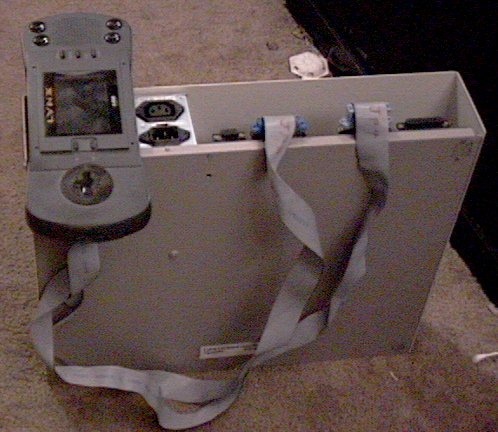 The SDK’s 3.5″ floppy disks restore a Quarterback backup set to the system partition. You needed to have Quarterback software to use the disk. This is the way it works for the 1.6 revision of the SDK. Older sets may have worked in a different way. The backup sets were created using QB 4.2, but version 5.0 is also capable of restoring the set. The restore would add custom files for the Workbench 1.3 operating system under C2, replace some its system files in the C folder and place the SDK tools and source code (actual sources, include files, macros and sample code) in two folders called 6502 and HANDY. The development software contained the compiler, sound and rom creation tools, and the source code for building Lynx programs. 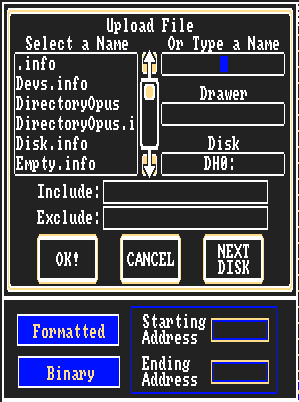 Additionally it had Amiga tools that made working with the Amiga as a development machine a little easier (e.g. faster fonts and a better text editor).